than my Pottery Barn Winter Birds bedding. I made some changes from the past year. Switching out some pillows and throws. in the Great Room last year. Now they adorn the antique split oak bench that was formerly in the Great Room. that will soon be decorated. 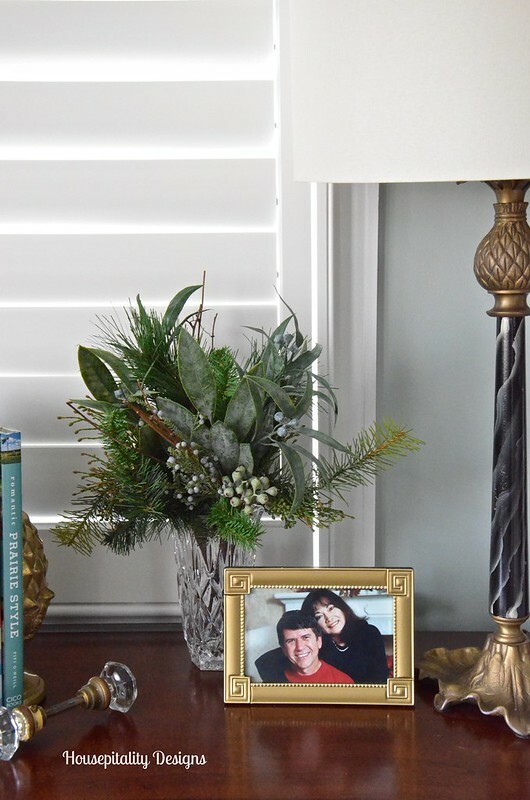 A crystal vase filled with evergreens sits atop the nightstand. with the exception of one new item, which you will see later. Love shopping the house and changing things around. 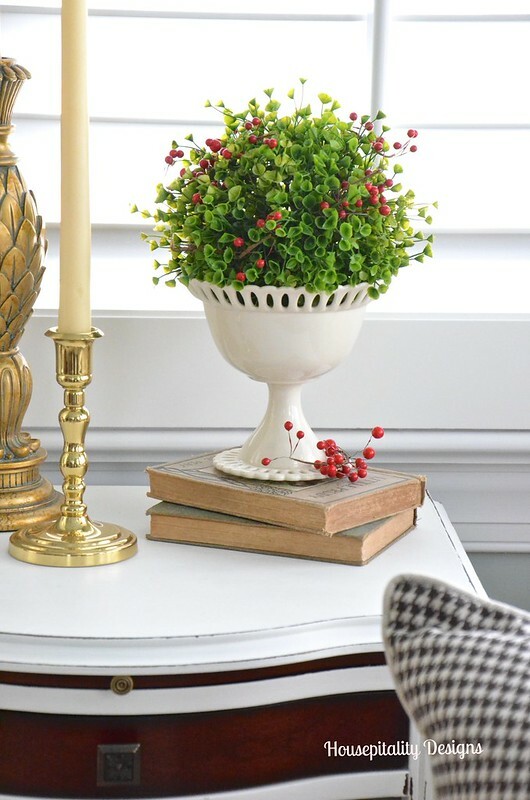 Red berries were added to an existing faux boxwood ball in a compote. 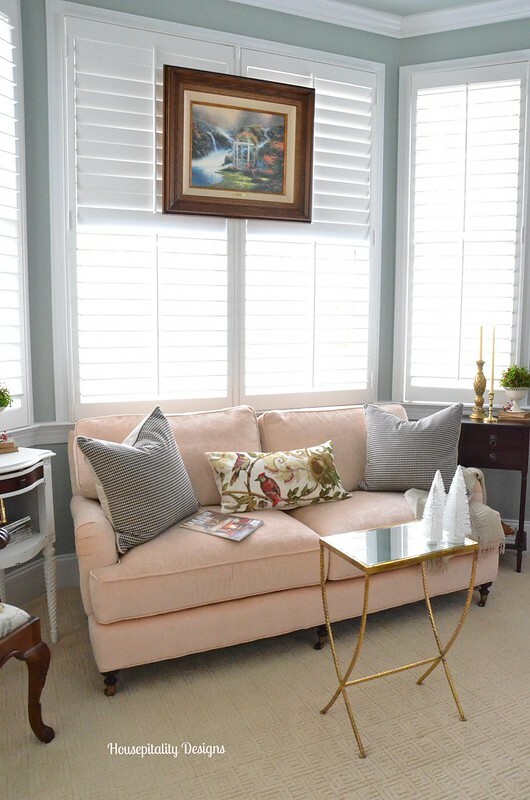 to warm up the sitting area and coordinate with the brown tones in the bedding. 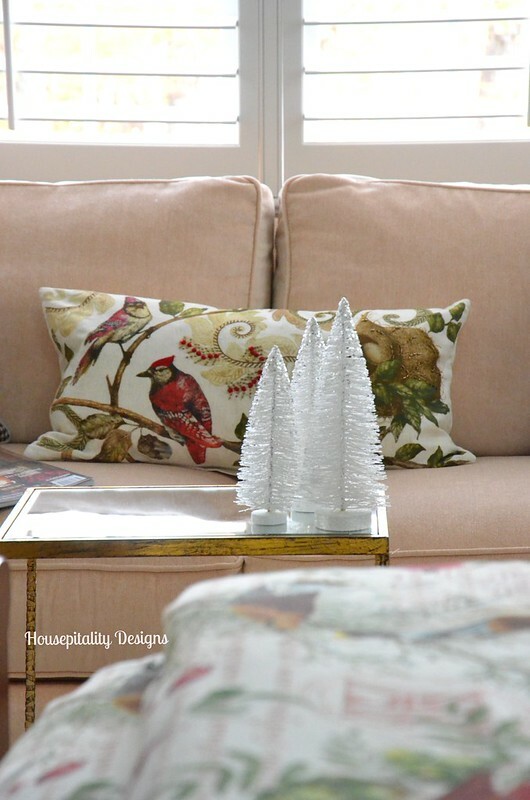 This sweet birds of winter pillow was a HomeGoods find. Keeping the sitting area simply decorated for the season. from Fall to Christmas/Winter, my hubby gave it a thumbs up. When he got in bed that night, he said, that there was something different. Oh wait . . . . yes, there is something different and new. And he said it before I could blurt it out. They are the Perfect Linens Second Skin Sheets. I chose the sheets without a decorative trim/color. I love the very subtle design that goes with any style/pattern of bedding. 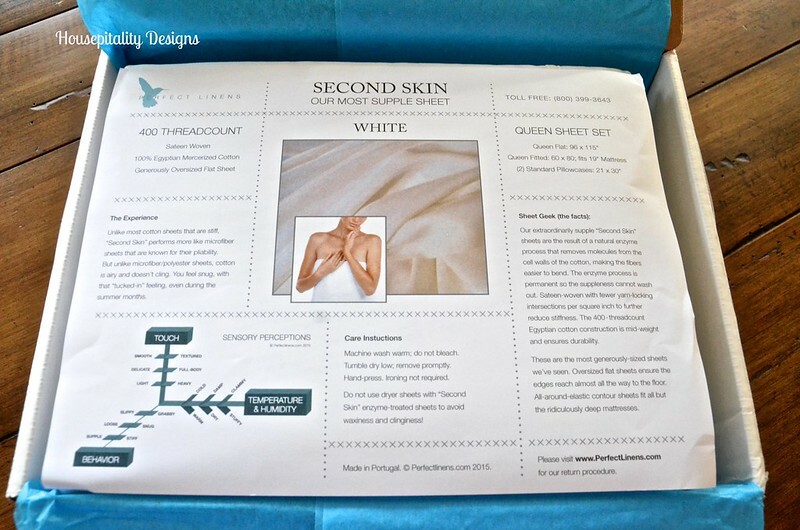 I must say that these Second Skin sheets are so luxuriously soft . . .
that I am that way too. biggest retailers, no one knows sheets as Perfect Linens. they identify the most comfortable sheets. They are unique with their novel emphasis on objective research. of the same Second Skin Sheets . . . As I stated previously, I chose the one with no trim. Sheets change after use so they test after multiple launderings. Shoppers know how they’ll feel during their lifetime, saving money and eliminating frustration. Perfect Linens offer free shipping both ways as a satisfaction guarantee. curated selection of exceptionally comfortable sheets… the best of the best. All opinions are joyously my own! 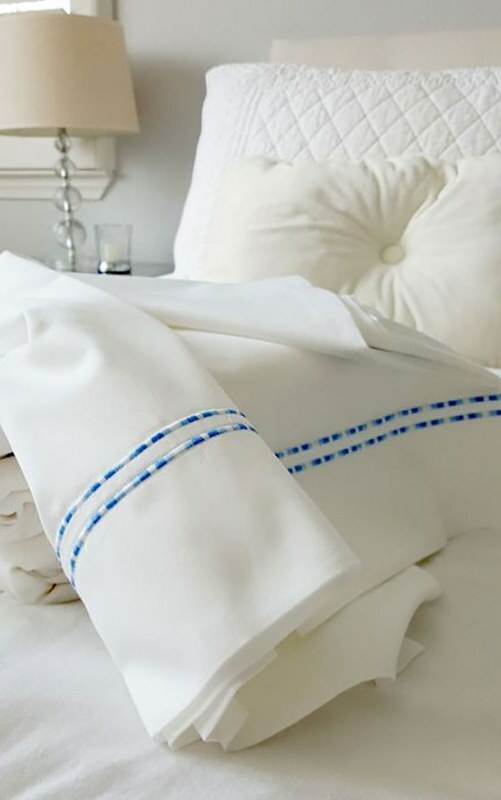 For purchases under $100, Perfect Linens is offering a 15% discount. Use the code Housepitality15 for purchases under $100. These codes do not expire. Have a most wonderful day! Mine will be spent continuing the Christmas decorating! Pretty pretty and I love the HG pillow. No pottery barn outlets in our neck of the woods! Your master always looks nice and cozy in the winter Shirley! I love the PB bedding. I keep trying to find it on Ebay. Love the picture of you and your hubby. Very pretty! I especially like that fur trimmed red pillow! I don’t blame you for keeping that bedding- it looks perfect in your room. I just adore your bedroom- that ceiling is amazing. It looks great, Shirley–you are ready for the season. I’ve heard those sheets are wonderful; thanks for sharing the discount with us! You know that I adore this bedding and have the same!!! Santa brought it to me last year and I can’t wait to use it! I also JUST bought a beautiful crystal vase to do the same thing!! Great minds??? And I have gotten out the BOX full of Baldwin brass candle sticks and sconces that my friend GAVE to me! Our master is about to have a big change:) Now all I will need is the darn shutters!!! Santa, are you listening/??? LOL! I love the HG pillow too! Your master is so very beautiful. Have a beautiful day, I am decorating too!!! 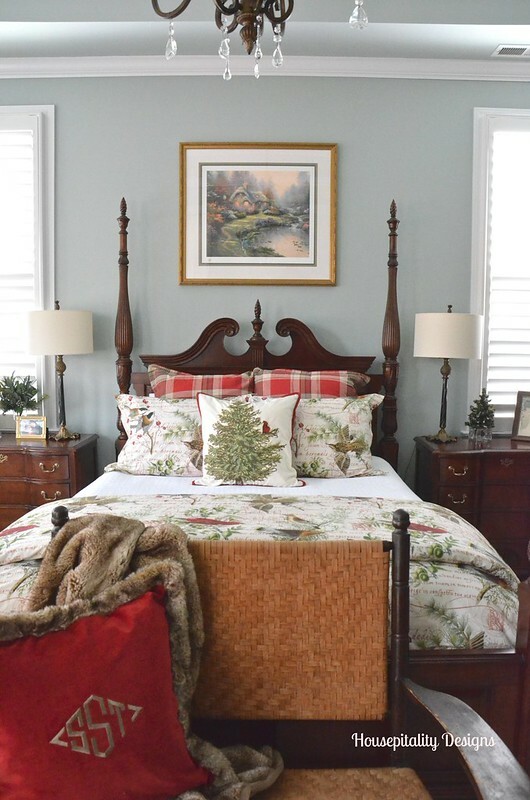 Shirley, your master bedroom looks beautiful, all dressed for the holidays and winter season! So cozy! You room looks so cozy and inviting for winter. 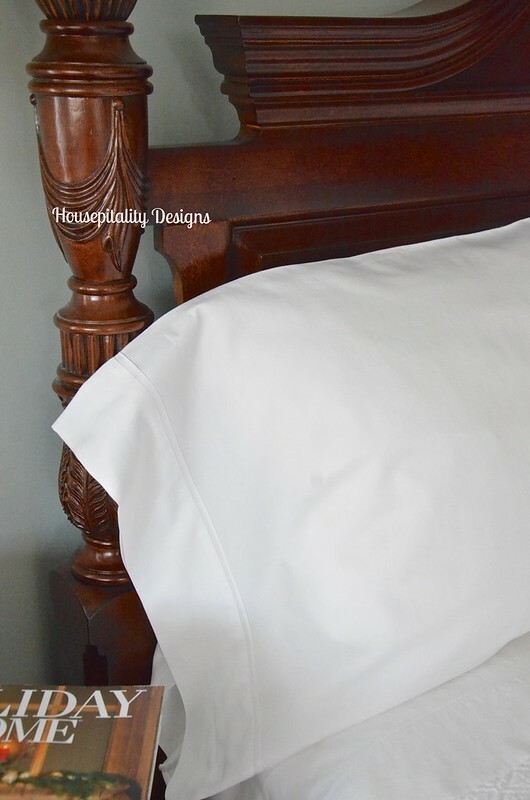 I have some of the perfect linen sheets and they are wonderful right out of the gate and with each wash they get better and better, Great for a Christmas gift!! I seriously wouldn’t even want to get out of bed if our bedroom looked like this! 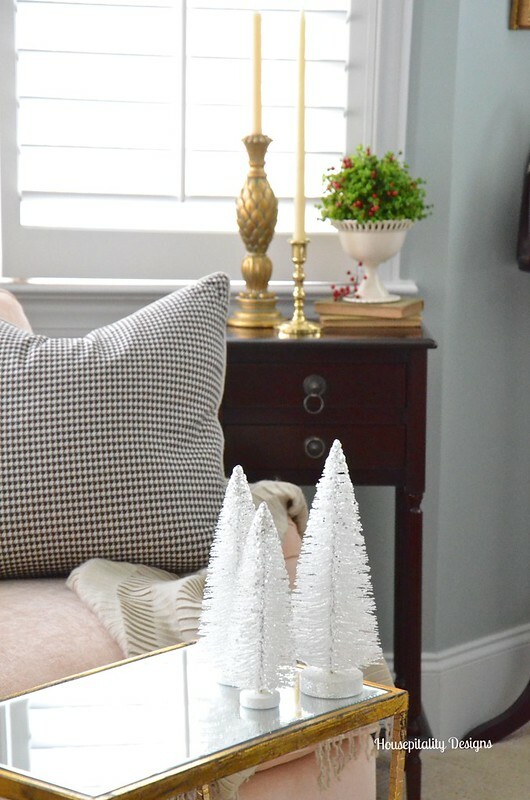 It’s soooooo inviting … cozy … festive … happy … and serene! I love all of your Christmas decor and can’t wait to see more! 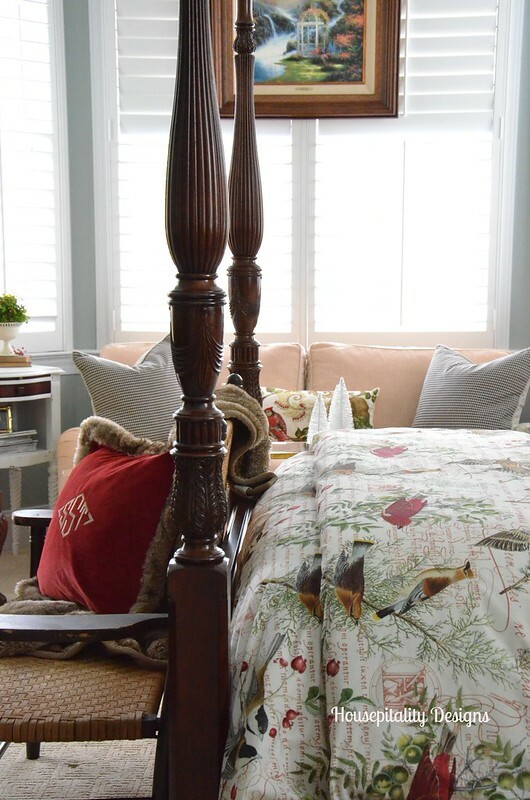 Your bedroom looks so cozy for the coming winter months. Shirley there is nothing so nice as luxurious sheets to sleep on! They make all the difference in the world! 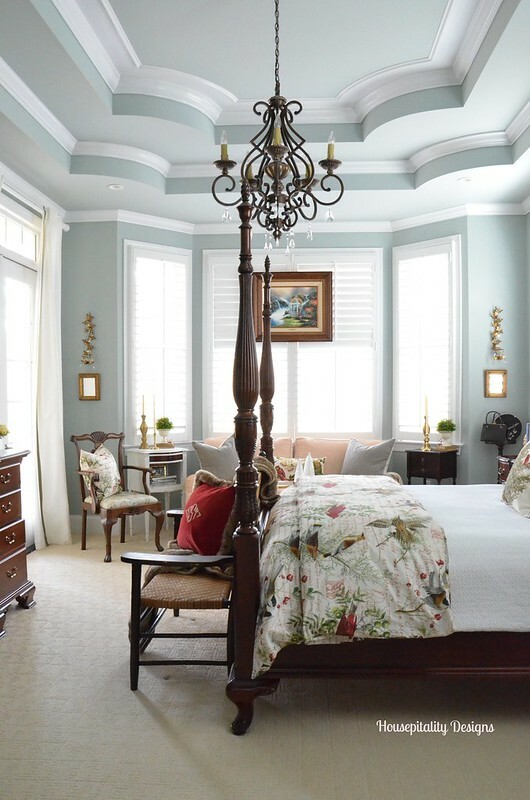 Love your master bedroom! 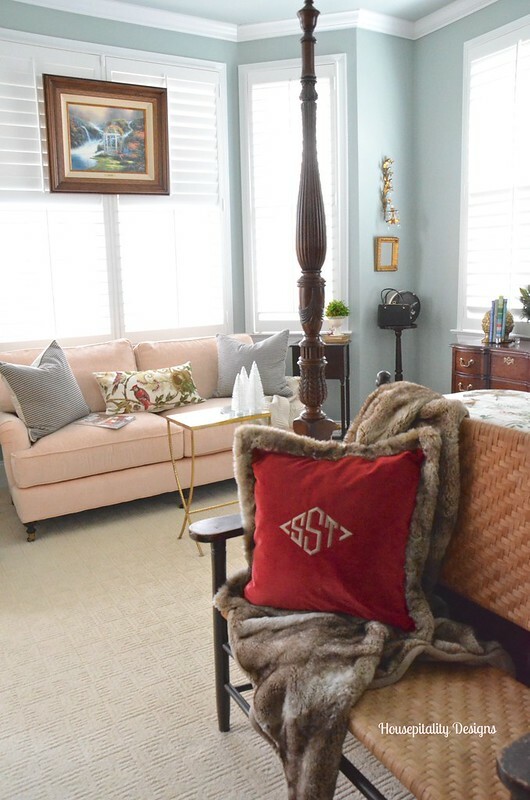 Stunning Shirley, love the throw and the fur monogrammed pillow. Classy addition to already pretty bedding. This bedding will be hard to top in my opinion. I don’t start until after Thanksgiving. Beautiful Shirley! Birds of a feather flock together, I bought the same bird pillow at HG yesterday 🙂 I loved the shape and the detail of the nest! There is nothing better than new soft sheets, thanks for the coupon code, I’ll check them out! 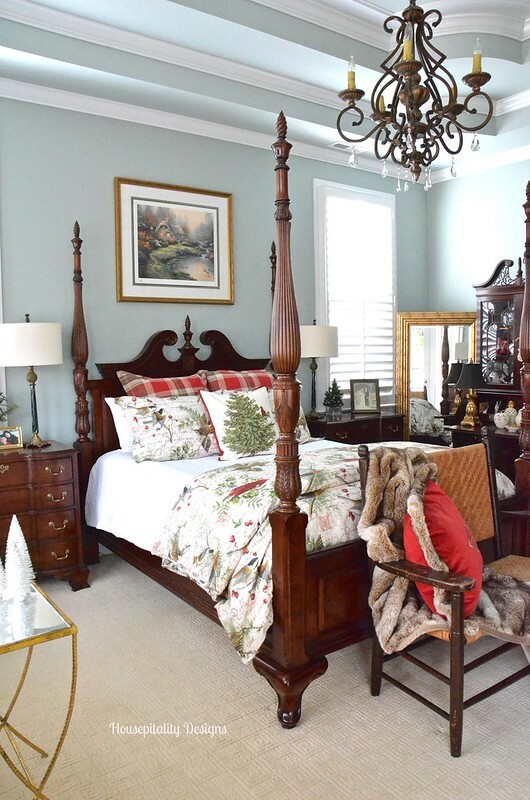 Shirley your master bedroom is truly a “Dream Bedroom”. I love it all year round with your wonderful seasonal touches. Simply stunning! 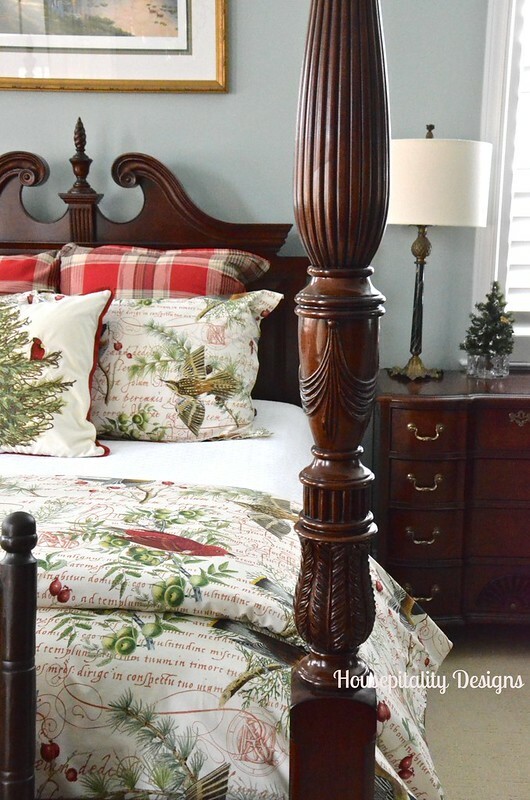 Ahhhh your guest room is so pretty and ready for your holiday guests. 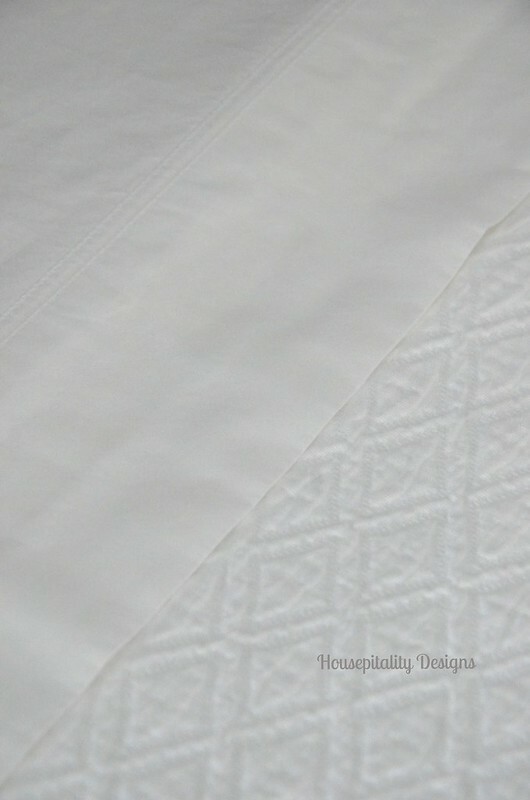 I have the Perfect Linen sheet set in plain white and love them. They wash like a dream and are so soft. Everything looks so inviting and beautiful. This looks so lovely. I’m sure you and your husband will enjoy the serenity. So pretty Shirley I want those Christmas pillows, you have the decorating touch girls. The master has the perfect touch for Christmas! 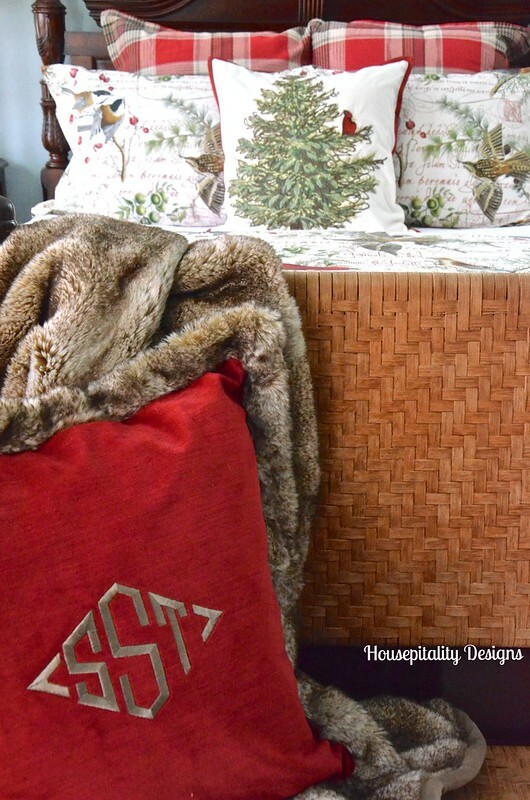 I love changing bedding for the season, but I haven’t found anything that I particularly wanted for the Christmas season!! Beautiful, Shirley!!! I love your nightstands! Could you provide the manufacturer and style if possible. Thank you. Thanks Nanette…They are by Fine Furniture….purchased many years ago from Furnitureland South in North Carolina. I love the birdies! Your rooms are always so beautiful, Shirley:D The faux fur is divine! I bought myself a tree skirt from RH last year and I just love it! Cindy’s recent post…In 1923…and My First Giveaway! Shirley, I’m just getting caught up on my blog reading. Your bedroom looks beautiful! I would never want to get out of bed or leave the room. Your accents are perfect! So beautiful, Shirley! I would snuggle in that bed and not want to get up. You are a pro at creating beautiful spaces. Oh It looks so beautiful and so luxurious!! Once again, you did a great job!! Happy Thanksgiving!! I found your bedroom picture on Pinterest. What is your paint color on the walls and trim. It’s beautiful as is the rest of the room! Thank you in advance!